Collineo Inc. is a manufacturing integrator whose mission is to bring innovative and high-performance high mobility robotics solutions to diverse application areas, in support and extension of operators. From civil protection to field operations, Collineo aims to provide professionals with new advanced-technology tools to help them accomplish their tasks in a more secure and efficient manner. To comply with today's requirements for a better environment, Collineo is totally committed to integrating environmental considerations in its solutions to confer its customers with a competitive lead. As complementary activities, Collineo also uses its engineering and manufacturing expertise to propose solutions in other high-technology industry sectors such as instrumentation equipment, energy transformation and off-road vehicles. Agile, low-cost and light-weight (7 kg.) 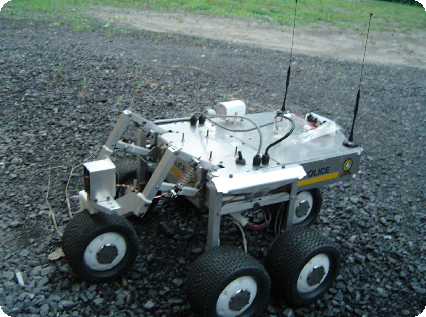 remote controlled vehicle equipped with Immervision's cameras (2007 improvement) for tactical interventions.